Body Tracking - The combination of activity, steps and overall movement is used to provide a Body Score. This information is tracked daily and accessed easily in the Thrive app. A daily score of 100 points is possible. Brain Health Tracking - When you hear better, you have more energy to listen longer. You’ll spend less time trying to hear what’s being said and more time participating in conversations. 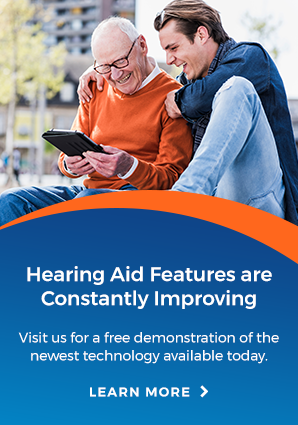 The Thrive Hearing app measures the brain benefits of wearing hearing aids by tracking your hours of daily use, social engagement and active listening to provide a Brain Score. A daily score of 100 points is possible. Thrive Wellness - A combination of your Body and Brain Scores provides a good overall assessment of your health and well-being. This is your Thrive Wellness Score. A total daily score of 200 points is possible. New technology provides consistent wireless performance through your smartphone or wireless accessories while streaming audio from cell phones, TV, music, and other media. You can even geotag memories. A geotagged memory will use GPS and cellular towers to recognize where you are and automatically adjust your Livio AI hearing aids when you enter that space. For instance, a geotagged “coffee shop” memory will automatically activate when you walk into your favorite coffee shop. Easily locate lost hearing aids using the Find My Hearing Aids feature, with both a location and a timestamp. A signal detector sends a stronger or weaker signal based on how close you are to locating your Livio AI hearing aids. Next week will be the final in our 'Welcome to the Hearing Revolution' series. That post will feature the awesome new accessories you use with the Starkey Livio AI!